Our March 2019 program is rich from the jazz of Buula, to the vocal powerhouse that is Silayio, followed by the Afro Benga Beat of Makadem, and lastly the soul/r&b flavor of Wambura Mitaru. This week we feature Jazz composer and Saxophonist Buula. Check out his profile below. 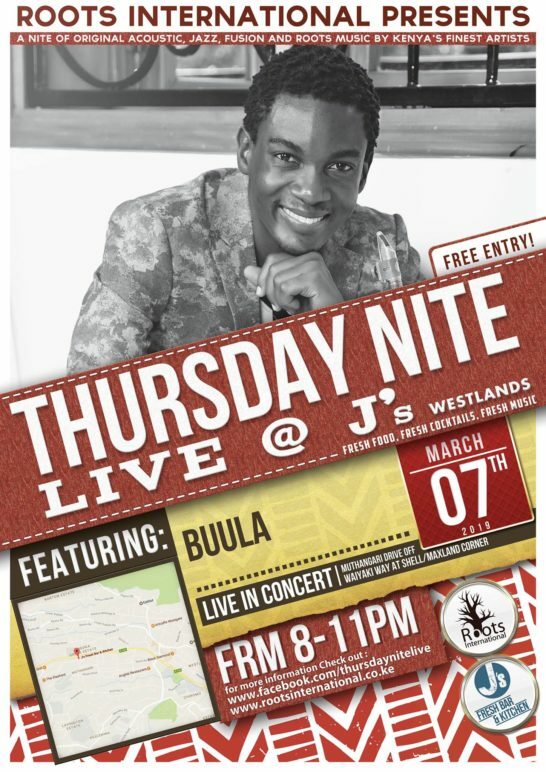 Buula aka Brian Mugenyi is an East African Quintessential saxophonist born in Uganda, living in Nairobi. He is a composer, singer and songwriter. Buula for years worked with some of his home country Ugandas leading bands Qwela and Code 9 until he resolved to a solo career in 2012. He has worked and shared stages with numerous artistes and musicians in their own rights across a diversity of genres of Pop, RnB, Afro-Soul, Hip hop, Jazz and fusion, with the likes of the incredible Richard Bona when he performed at the Safaricom International Jazz festival at Michael Joseph Centre in Nairobi(2014). He has traveled across borders on the continents of America, Asia, Europe and Africa sharing his his gift on platforms of diverse magnitudes. He spent this new year’s eve In China performing at the ISY festival in Sanya, supporting artists like Victoria Kimani, ROZ and Franck Biyong. He’s performed alongside the renowned grammy award winning Jazz artists BWB (Kirk Whalum, Norman Brown and Rick Brown) during the 2018 Safaricom Jazz festival. He’s also shared stage with Manu Dibango, an African legend in Music. He’s performed at Ronnie Scott’s while in England, sharing stage with incredible British musicians. In 2015 he was hosted as one of the acts at the Zanzibar International Film Festival (ZIFF) where he shared stage with Salif Keita. He was the Ugandan act at the 2015 Jahazi Literally and Jazz festival in Zanzibar and 2015 Karibu music festival in Bagamoyo Tanzania. He released his first CD titled Take Time in 2013.